"Baby Word Scramble" Baby Shower Game. Looking for a baby shower game? 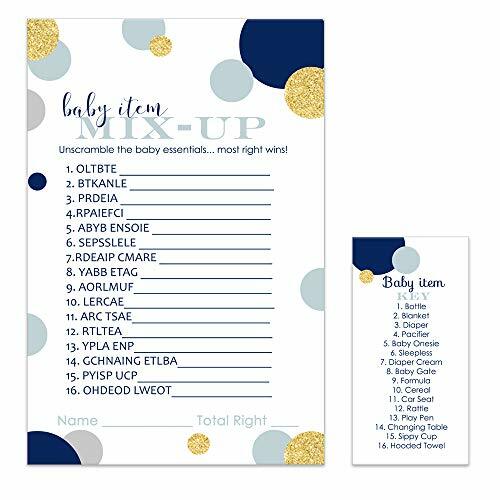 Whether the new mom is expecting a girl or boy, our "Baby Word Scramble" baby shower game is a great icebreaker for your guests! 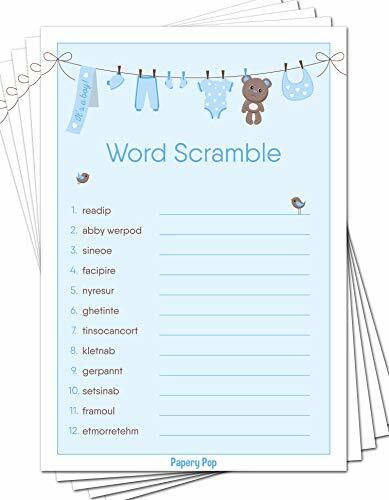 Includes 40 different words or phrases to unscramble with the first one done for you. Your guests will enjoy this fun challenge and will be scrambling to be the first one finished! Be sure to have a prize on hand for the winner! 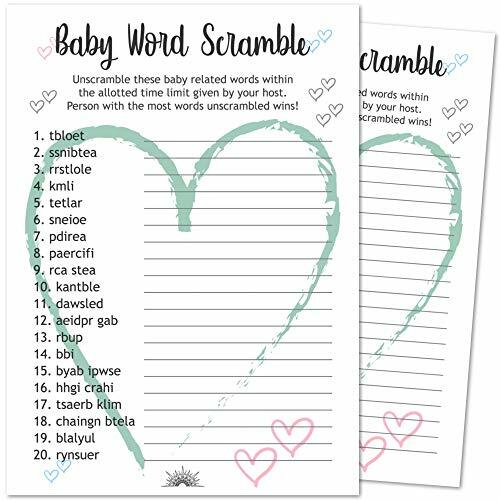 Includes 4 dozen illustrated "Baby Word Scramble" baby shower game sheets. 8 1/2" x 11"
Our complete set of 5 fun and easy to play baby shower games will keep the party moving with laughs. What better way to celebrate than by playing our baby shower games at your parties. This set includes: Word Scramble; Wishes for Baby, Bingo, Predictions, and What's In Your Purse game. Set includes 50 activity sheets for each design, perfect for your party of 50. 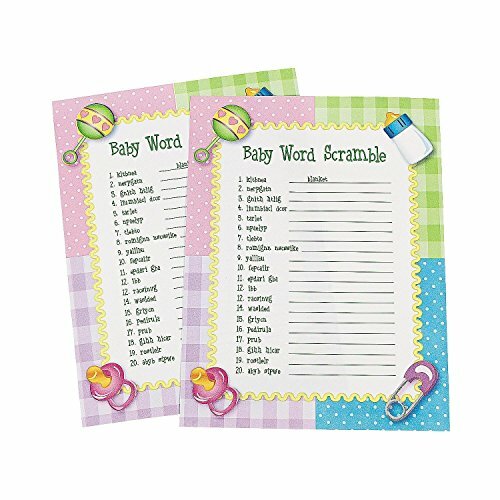 These baby word scramble cards are printed on premium satin paper and can be written on with either pencil or pen without smearing. Each card measures 5.5 x 8 inches and comes with a cute design that your guests will absolutely love. With 50 sheets included, they are the perfect activity for any baby shower, gender reveal or baby bump party! Once the event date arrives, let your guests try and guess the correct answer to the 14 questions. Then using the answer sheet included, go over the questions to find out which guess has the most correct answers to win the game! The whole set of cards comes securely packaged in a rigid mailer envelope to ensure that you receive them in perfect condition. Copyrighted design registered by Papery Pop. 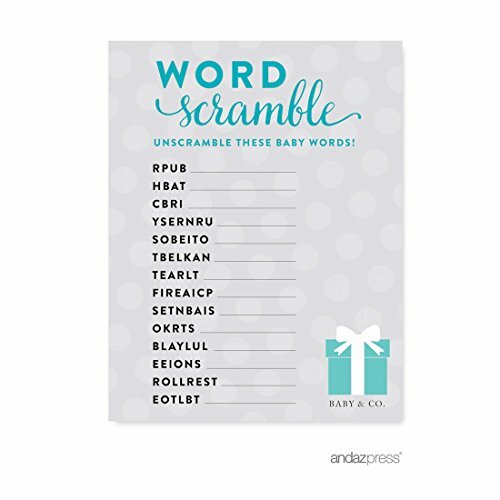 Bring out the friendly competition with our classic baby shower word scramble game. Whether you are hosting a baby shower, gender reveal, baby sprinkle, or sip and see; our game is perfect for you. 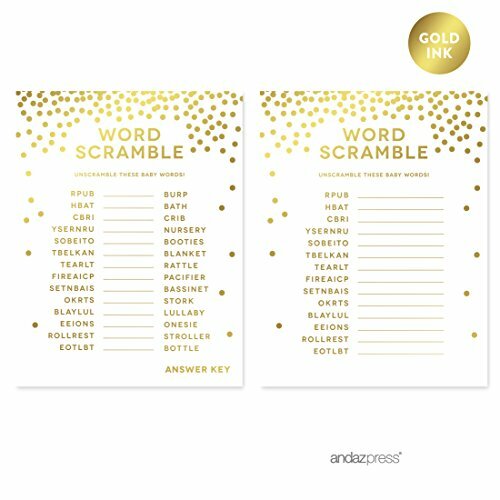 We've worked hard to create a great mix of both easy, medium, and hard scrambled words so your guests are neither frustrated or bored. In order to play, the host simply passes out the game cards and decides on a time limit for the guests to unscramble the words on the sheet. The most popular time limit is between 1-2 minutes for game play. 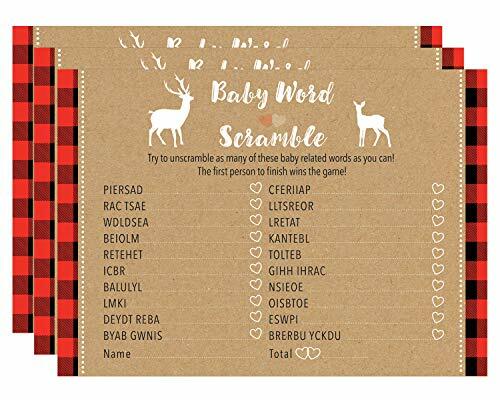 This adorable rustic woodland themed Baby Word Scramble will be a huge hit at your baby shower. It features a silhouette of a father deer and mother deer against a warm and cozy color and pattern palette of brown, white and red buffalo plaid. The buffalo plaid borders and sprinkling of hearts with each answer line make it the perfect baby shower companion to a lumberjack, woodland or animal themed baby shower. The game includes twenty scrambled words that are all related to babies! Each player will try to figure out what each word is and the player(s) with the most correct will win the game! The game sheet includes space at the bottom for the name of the guest and total number of answers that were guessed correctly. Game sheets are generously sized at 5" x 7" giving guests ample room to write. Font and font size offer clear and crisp printed text making it easy for players of all ages to read and understand. The gender neutral design of the baby shower game can be used whether the parents-to-be are expecting a boy, girl or want it to remain a surprise. The design also pairs well with an all-women, co-ed or all-ages baby shower. Game sheets are printed on smooth, sturdy and durable cardstock, not actual kraft paper. Pack includes 24 game sheets and one answer sheet for the host. Looking for fun ideas to get everyone to celebrate the arrival of your little one? This fresh and fun baby shower game idea is perfect for both small and large groups of men and women. This is not your run-of-the-mill baby shower game that will induce cringe-worthy reactions and silent internal screams from your guests. It may be cheesy and ridiculous, but this out-of-the-box baby shower game will keep your guests laughing and talking for hours. This is one unique baby shower game that is actually fun (really!) for the mommy-to-be and her special guests. 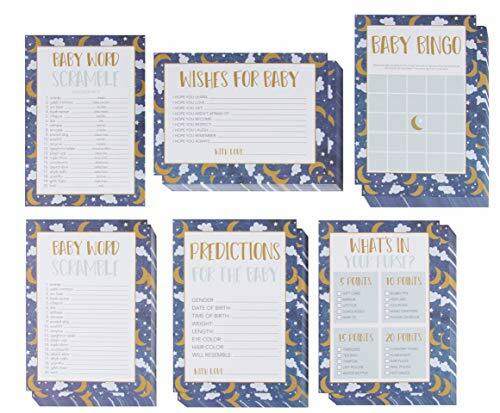 Professionally printed on heavy cardstock, these baby shower game and activity pieces can also serve as a unique framed scrapbook memory of your special day. Don’t forget to get a baby shower prize for the winner – and no, it can’t be a poopy diaper. Made in the USA. Tuner Car Rollout - IT'S A SCRAMBLE BABY!